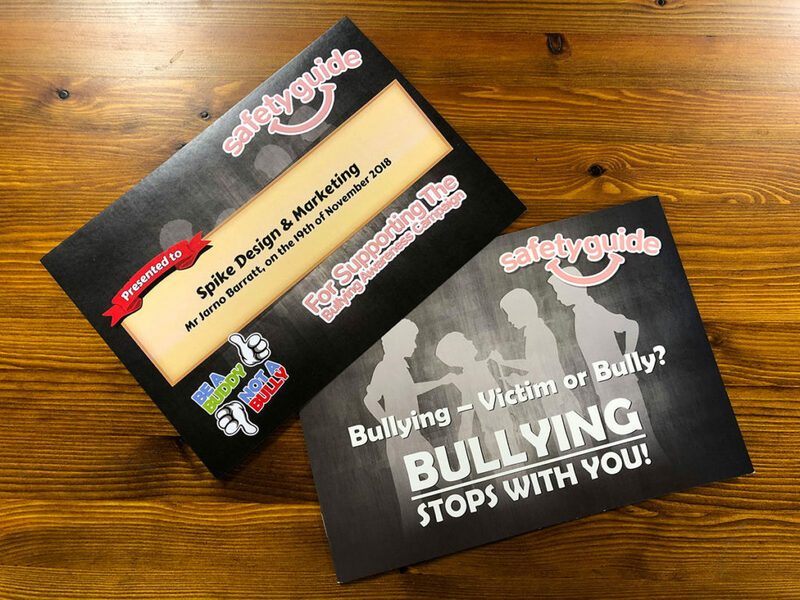 We recently sponsored Safety Guide in aid of their Bullying Awareness Campaign. Safety Guide specialise in providing educational guidance, whilst supporting national initiatives of change for young people in our communities. For this particular campaign they provide a selected school with free safety booklets, enabling the pupils free access to an ‘easy to use’ app, which provides information and learning to reduce the effect of bullying, grooming, and dangers such as drug and alcohol abuse that they may encounter. The themes of the booklets are broadly linked to the PSHE curriculum at school, which can be used by teachers and pupils during lessons, educating the elements of risk management, resilience and self esteem in line with the national curriculum framework which states that schools should make a provision for this learning. Ofsteds research also supports this. SpikeDM’s school of choice was Corby Old Village – a local primary school with a strong history of serving the local community and teaching generations of local families. We hope that this information and awareness resources can help educate and provide tools to help in the protection of children. Recently we were given the task of optimising a dedicated page for Robinsons Auto Logistics based around ‘Covered Vehicle Transport’ and injecting the keyword into the homepage in order to promote the service and improve the sites rankings for the search term. Originally, the site was optimised around ‘Prestige Vehicle Transport’, however the client decided that it would be more beneficial to change this to covered as it is a much more popular search term and if the site was highly ranked for it, it could generate significantly more leads and enquiries. We recognised that with approximately 96800000 more search results than the previous keyword, we were facing a more competitive market with larger companies. Before we done any work on the site, we searched Google for Covered Vehicle Transport to see where the site appeared in the results prior to any optimisation. We found the Robinsons site 3rd on page 9, which may not sound too bad considering there are about 123,000,000 results – however it’s a known fact that the average web user won’t go past the first five listings on a search engine results page and 95% of web traffic goes to the results on the first page. This leaves only 5% for the entire remaining results, so if you’re ranked on page 9, the chances of receiving any traffic or leads from search results is pretty unlikely. 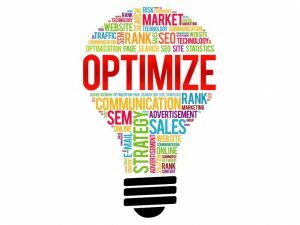 Our approach to optimising sites is a lot more in depth than simply scattering a few keywords wherever they can fit into the content of the page and hoping for the best. We write content for actual humans who would be searching for your site and not search engine robots who are coming round to index it. 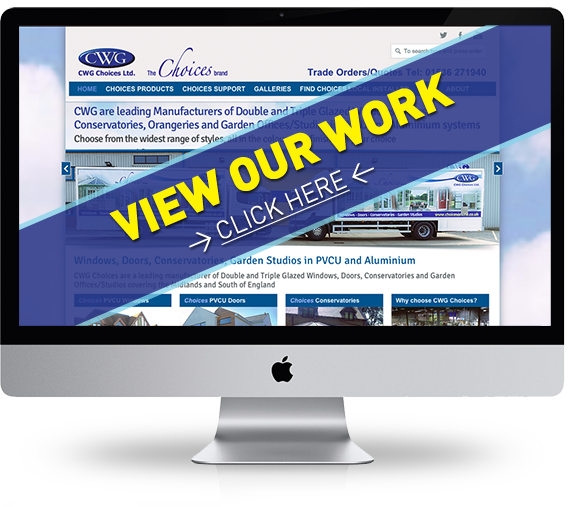 We created content that flows well, is clear and ultimately helpful and informative to someone who would be looking for Covered Vehicle Transport. Instead of solely focusing on keywords, we incorporated synonyms and adjectives that all relate to the main focus of the page to further the quality of the content. The optimisation doesn’t stop at just the content of the page either, we ensure that we tailor meta information, headings, alt and title tags, as well as file names, external and internal links and much more all to relate back to the content of the page. We also inspect the site to ensure that there are no errors that it would be penalised for, such as a slow page speed, responsive design, non-secure network or robots.txt errors. Once we were are with the optimisation on the site, we then re-submit the URLs of all updated pages to both Google and Bing so that with newly refreshed content, they will be re-indexed. There’s no definite time scale with SEO due to it being so unpredictable, but within the space of just under a week we have managed to get Robinsons Auto Logistics to rank at the bottom of page 2 for ‘Covered Vehicle Transport’ already! This is a significant improvement with a jump of 7 pages, and we have already seen the improvement with more traffic to the site. We are now working on any small improvements or tweaks we can make to the site in order to give it a little bit more of a boost, and we’re confident that Robinsons will be found on page 1 for ‘Covered Vehicle Transport’ in no time. For information on how we can help your sites SEO give us a call on 01536 560555 today or enquire online and a member of our team will be in touch. One Marketing trend that is predicted for 2018 is the rise in Video Marketing. Proven to be the most compelling form of content to users and increase attention and leads dramatically, it’s not a solution that your business should be ignoring. Success comes with informative and exciting content and with numbers such as 40% of users engage more with Videos in comparison to plain text, and it’s said that Websites with Video Content are 40x more ‘shareable’ – Video Marketing really does seem like the perfect place to start. Some people associate Corporate Videos as cliche and ‘cheesy’ – which was essentially true in the 80’s and 90’s. Nowadays, Video Marketing is being brought back with a more modern twist. If you find the correct marketing agency, Video Marketing can be a sophisticated, professional way of presenting information to your potential customers, whilst being entertaining due to the engaging and refreshing format. With so many people immersed in their phones and social media these days, posting clips on social platforms and your website is actually proven to be more effective than broadcasting your advert on TV. We recently produced a series of memorable and effective Corporate Videos for Auto Logistics Specialists Robinsons Auto Logsitics that focused on their range of services and expertise. They wanted a professional collection of footage that was commentated by a scripted voice over, explaining the background info to the footage that was being shown. In these videos we incorporated impressive clips and drone shots of their large premises to really emphasise and showcase the impressive features that would not have been done justice in plain images. Watch their corporate video and see how we can make your content engaging. Call us on 01536 560555 or enquire online to get into contact with us.